A modular easy to install roof walkway system designed to the requirements of EN 516:2006. Kee Walk® provides a safe, anti-slip, level walkway for anyone who needs to access a roof in the course of their work. It provides a clear demarcation route which protects the roof surface from unnecessary damage and uniformly distributes the pedestrian load across its surface. Kee Walk® is designed for modern roof types including trapezoidal profile composite or built up and standing seam metal roofs. 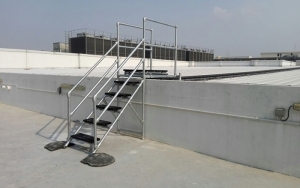 It can be used on flat, barrel and sloping roofs, with steps and a traverse option allowing access to be created for virtually any roof configuration from 0 to 35 degrees. The product complies with the test requirements of EN 516:2006. 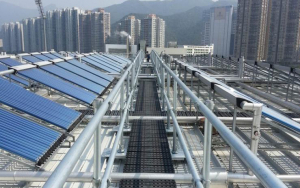 Kee Walk® is is available as standard in Nylon or Aluminium treads, the system is offered in standard modules, which can be supplied ex-stock for rapid installation on vitually any rooftop project. The modules are supplied as 1.5m and 3m pre-assembled sections to suit the requirements of different roofs. These lightweight modules are constructed from glass reinforced nylon treads or aluminium attached to aluminium support beams that are fixed to the roof surface. Steps and a traverse option, complete with an adjustable hinge, enable Kee Walk® to be added to roof configurations from 0 to 35 degrees. The installer can easily set the angle of the steps, by removing the locating bolt in the hinge, adjusting the angle and replacing the bolt at the desired point on the hinge. No bespoke parts are required. 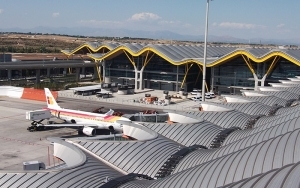 EN516:2006 is the European standard for the test requirements of roof access walkways, which include measuring the deflection and residual deformation under specified loads. These criteria have been surpassed in all testing and as this is a harmonised standard allows the system to be CE marked under the European Construction Products Regulation No. 305/2011. 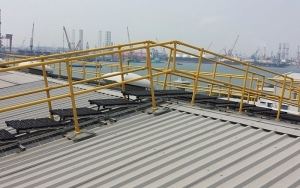 The Kee Walk® roof walkway system is fully compatible with all horizontal safety line systems including Kee Safety's KeeLine® system.